Dr. Robert Holton, whose research focuses on the synthesis of complex organic molecules, is a leader in the field of synthetic chemistry. Holton is most often recognized for being the first to synthesize Taxol, a powerful and widely used cancer-fighting agent. Over his career, his work on taxane natural products has led to significant advancements in cancer research and treatment. Besides Taxol, Holton was able to synthesize a range of natural products. Most notable are Prostaglandin F2a, a naturally occurring prostaglandin used in medicine to induce labor; Narwedine, an important chemical reaction compound; Aphidicolin, an antibiotic with antiviral and antimitotical properties; Taxusin; and Hemibrevitoxin. 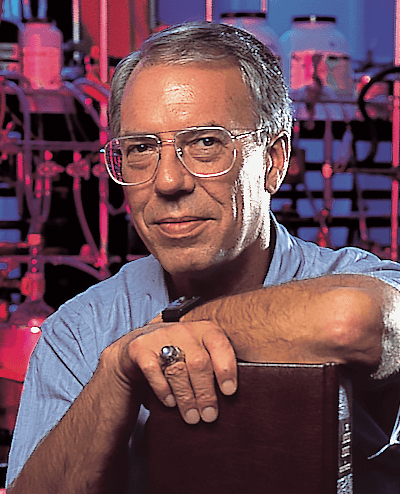 Holton began his academic career as an undergraduate at the University of North Carolina and later received his Ph.D. in chemistry from Florida State University. After holding positions at Stanford University, Purdue University, and Virginia Tech, he eventually returned to Florida State in 1985 to teach and conduct research. In 1997, Holton co-founded Taxolog, Inc., along with his colleague Lewis Metts. For more than a decade, Taxolog continued to develop and commercialize unique drugs based on taxanes for the treatment of cancer and other diseases. Today, Holton is the Matthew Suffness Professor of Chemistry at FSU, where his research group continues to study the synthesis of taxane natural products and their application to cancer treatment. Holton holds over 125 issued U.S. patents. His accomplishments are a testament to his dedication to science and medicine. His Taxol was the top selling anti-cancer drug in 1995 and generated over $1.6 billion in revenues by the end of the decade. In addition, Taxol generated the largest patent payout in history for a single university (FSU).